Let it be noted that this was the week when I finally managed to get started on my fall/winter veggie garden. I got two kinds of winter squash - acorn and butternut - planted, as well as red and yellow onion sets. I have three more kinds of winter squash (I do love winter squash! ), as well as peas, that I hope to get planted tomorrow. Those onion sets had been resting in my refrigerator since April. I had ordered them last fall, with instructions to the nursery that I wanted them for fall planting and, if they could not ship them in a timely fashion, they should cancel my order. I later received an email from them saying that the sets could not be shipped at the time I had requested and my order would be canceled. So I forgot about them. Imagine my surprise then when I received a shipment in early April of all times! I find it is very hard to convince nurseries in other parts of the country of just what our growing season is like here. Which is a good reason to only deal with nurseries in the area, or at least in the state, when we are ordering plants. Seeds, of course, are another matter, although you do want to make sure that the seeds were produced under conditions that are amenable to our climate. Well, anyway, I stuck the little onion bulbs in my refrigerator drawer for five months and now I've planted them. I'm interested to see what will happen with them. The ground that I planted my seeds and bulbs in was dry, dry, dry. I watered well as I was planting and then ran the sprinkler in the area again today. Unless we get rain soon, I'm going to have to run the sprinkler every two or three days until my seeds germinate. Let's hope that our fall rains get started a little early this year. This week the Stapelia gigantea is still producing blooms and still drawing in flies from far and near to those odoriferous blossoms. A much prettier pollinator is this Giant Swallowtail butterfly visiting a Hamelia patens blossom. 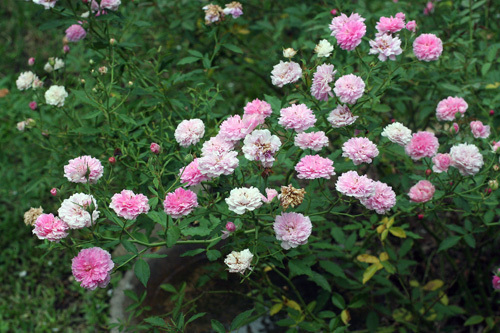 The old-fashioned polyantha rose, 'Caldwell Pink,' is in bloom, as it is most months of the year. The white beautyberry is full of these berries and the mockingbirds are eating them just as fast as they can! The almond verbena's blooms are not very showy but they have a delicious scent. 'Coral nymph' has become one of my favorites among the salvias. We celebrate the rare occurrence of a "Blue Moon" tonight, the last one until 2015. This Blue Moon ironically falls on the day of the funeral of Neil Armstrong, the first man to walk on the moon. It seems appropriate somehow. And as we get ready for the last big holiday weekend of the summer, I hope your garden under the Blue Moon is in good shape for the coming season. I've been surprised and delighted to find a new butterfly in my garden this year. At least it is one that I had never seen here before. It could have been here in the past and I just didn't see it or didn't recognize it. It is, after all, a black butterfly in the swallowtail clan and there are several others that look very similar to it, so it might be easily mistaken for one of them. But once I identified it earlier this summer, I've been on the lookout for it and I have not been disappointed. It is the Palamedes Swallowtail and I think you will agree with me that it is quite a beauty. Moreover, it is a big butterfly, easy to view. At a maximum of 5 1/2 inches wingspread, it is almost as big as its cousin, the 6 inch Giant Swallowtail. This butterfly's favored habitat is wooded southeastern swamps. I think it has probably shown up in my yard because of our proximity to Spring Creek and its backwaters. Also, my small fish pond coupled with the rainier summer we've had this year may have helped to draw it in. For whatever reason, butterflies of this persuasion have been present here throughout the summer. According to my John and Gloria Tveten butterfly guide, Butterflies of Houston & Southeast Texas, the butterfly's range extends along the Atlantic and Gulf coasts all the way from southern New Jersey to Texas and even into Mexico. It is a strong flier and also wanders inland from the coast which is how it came to be in my yard. It nectars on a wide variety of flowers. In my yard, I've seen it on petunias, as in the picture above, and also on azaleas, Hamelias, cestrum, buddleia, flame acanthus, cannas, day lilies, sunflowers, hibiscus, and cypress vine. Obviously, it isn't a picky eater. Unless you can catch it sitting still to sip nectar, it is not that easy to photograph. As noted, it is a strong flier and it zips around quickly and often erratically, as many butterflies do to confuse their predators. Here, you can see a bit of a dorsal view of the wings and the yellow band and spots that mark those wings. The Palamedes in flight, with a ventral view of the wings, where you can see the distinctive double row of big orange spots on the hindwings as well as the pale yellow dots on the leading edge of the forewings. This particular butterfly seems to have lost its "swallowtails" as well as having a bit of damage to the wings. Most butterflies that have been flying for a least a day or two will have some damage. According to Tveten, Palamedes are present here from April to December and may have two or three broods during that time. The larva are green with large eyespots and have a band of red along the bottom of the critters. 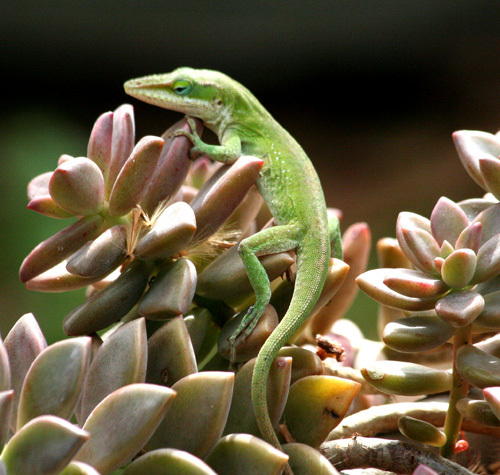 They feed on red bay, sassafras, sweet bay and avocado among other plants. I need to plant one or more of those in my yard. This has been an especially good year for butterflies of all kinds in my garden and now we are coming up to the busiest butterfly weeks of the year - autumn. It's just one of the reasons why that may be my favorite season. And this late summer and autumn, I'm especially happy to have the wonderful Palamedes Swallowtail butterfly as one of my beautiful visitors. This week has brought the first inkling that autumn may be just around the corner. First, we had some much-needed rain. Afterward, the humidity has been noticeably less and the early morning air has had a certain freshness that wasn't present before. Moreover, the maximum/minimum thermometer on the back porch has shown a couple of nights where the temperature actually dipped down to 69 degrees, the first time it has gone under 70 since spring. Around the yard, the trees have begun to tentatively shed their leaves. Yes, I think that autumn may really be on its way and it can't come a moment too soon for me and my garden. The garden has been receiving a lot of brightly colored Monarch butterflies this week as their fall migration is under way and they head toward the mountains of Mexico. Even though the passion vines have been repeatedly munched back to the stems by the caterpillars of the Gulf Fritillary butterflies, they continue to regenerate and now they are blooming again. Throughout the garden, vines are a big part of late summer and fall. The tiny tubular red blossoms of the cypress vine are a great favorite of hummingbirds and butterflies at this time of year. This sunny yellow hibiscus brightens my spirits every time I see it. A giant among the flames. The flame acanthus continues to send forth its orange tubular blossoms and the Giant Swallowtail butterfly is very glad it does. Giant Swallowtails are, in fact, quite numerous in the garden this summer. Happy little gerbera daisies and potato vine fill a pot by the back porch. As we head into autumn, I'm looking around the garden to see where I need to be concentrating my energies this fall and winter. Already I've identified two large shrubs that I need to move. As I've whined about here many times in the past, it seems that my life as a gardener has been marked by bad initial decisions in placing my plants. I almost always get it wrong the first time. This time it is the almond verbena and the 'Montrose Purple' vitex that are much too big for the spaces they occupy. So I need to relocate them to areas where they have more room to expand. It's the same old story that I reenact year after year. I seem to never learn from my mistakes, but I live in hope that eventually I will. I hope you've learned from all your mistakes and that everything in your garden is perfect this week! This week in the garden has been all about the hummingbirds. The hummingbird action has been frantic as both Ruby-throated Hummingbirds and Rufous Hummingbirds pass through on migration. The garden has plenty of the blossoms that hummingbirds love (like Hamelia) to keep them well fed, but, of course, I enjoy putting out the sugar water feeders for them as well and this week they've been hitting those feeders hard. The male Ruby-throated Hummingbirds have been passing through for several weeks now and there were still a few around this week. I had a female Ruby-throated Hummingbird who was in residence for the summer. I'm not sure if this is her or perhaps another migrant passing through. Last winter, I had a couple of female Rufous Hummingbirds that spent the season with me. I'm hoping that will happen again this year. Was this little girl one of my winter visitors and will she stay or move on? This male Rufous really, really likes that sugar water! He defends this feeder from all other hummers. In addition to watching and photographing hummingbirds, I did actually get a little weeding and pruning and general clean-up done in the garden this week. But mostly, I just enjoyed the hummingbird Olympics. August. Easily the most miserable month of the year in Southeast Texas and not only because it's the month when I officially become a year older. No, it's mostly because of the weather that we endure this month. At least that's what I tell myself. Last year during August we had 30 out of 31 days that were over 100 degrees Fahrenheit, and no rain. This year, the temperatures have actually been much more moderate than that, though still hot, but again, we've had no rain this month. The garden and its blooms are suffering. Still, here it is Bloom Day once again so out into the garden I go in search of whatever blooms I can find. I'm embarrassed to say that most of them you will have seen here many times before. Maybe I need to make a run to the nursery and get some new plants with some different blooms. This ruellia, 'Chi Chi,' is actually a thug in the garden, but I have it contained in a bed along my back fence where it is not so easy for it to spread. And I do enjoy these pretty pink blossoms. This is evergreen wisteria and it actually is not a thug unlike the purple variety. This is my third year to have it in my garden and it has not spread at all. Moreover, it has been full of these blooms all summer. Much of the milkweed is resting now and preparing to put on another flush of bloom, but a few of the plants still sport their colorful orange and yellow blooms. The old Clerodendrum bungei, also called Cashmere Bouquet or Mexican hydrangea, is full of these lilac-pink blossoms. And nearby, a relative, the Clerodendrun 'Bleeding Heart' vine sports many flowers, not all of them yet "bleeding." Esperanza, "Yellow Bells," blooms all summer long regardless of the weather and is a smorgasbord for bees and butterflies. The unique flowers of the strawberry bush are long gone and now it is full of these "strawberries" that give it its name. The pequin pepper blooms continuously over several months and produces a plethora of these tiny hot peppers which the birds, especially the mockingbirds, love. I grow it mostly for the birds. In fact, one common name for the plant is "bird pepper." 'Pride of Barbados' has outdone itself in producing blooms this summer. This seems a bit late for 'Queen Anne's Lace' to be blooming, but there it is! The yellow cestrum considers any month of the year appropriate for its blooms. The more common red variety. Those drops of water on the petals are not rain, unfortunately, but drops from the sprinkler. The Jatropha curcas has been a real trooper through this miserable season, gracing its spot by the little fish pond with wave after wave of these blooms. And, speaking of troopers, I can't do a Bloom Day post in summer without mentioning Hamelia patens which just blooms its heart out all summer long. One of the plant's common names is "Hummingbird Bush," and at this time of year, it becomes evident how it got its name. My garden is alive with hummingbird activity now. The Ruby-throated Hummingbirds have been passing through on migration and sipping from the Hamelia for weeks now, and just within the last few days, Rufous Hummingbirds started showing up in the yard. An adult male Rufous sits on a favorite perch just above one of the Hamelia shrubs so that he can head off any other hummingbird that tries to feed there. Nearby, an adult female heads toward the one of the sugar water feeders I have set up for them. These little flying jewels may not qualify as "blooms" but they are certainly adding a lot of color and movement to my garden these days! Thanks to Carol of May Dreams Gardens for hosting Bloom Day once again, and thank YOU for visiting my garden this month. Happy Bloom Day! The plant of this hot and humid but very dry week in my garden is the Stapelia gigantea, also called the Carrion Flower. It is a plant in the Asclepiadaceae family and is native to South Africa. It looks a bit like a cactus but its four-sided fleshy stems do not feature spines. A start of the plant was given to me by my friend Ursula a couple of years ago. I was a bit leery of it, to tell the truth, but I stuck it in a pot and basically just forgot about it for several months. That was in October. The next spring, there it was, hale and hearty. Obviously, the plant doesn't require much care. In fact, in researching the plant's care later, I found that it thrives on having a cool, dry rest period in winter, so I had inadvertently given it exactly what it needed to flourish. In the growing season, it enjoys having full sun and moderate water, preferably in a well-drained soil (2 parts loam to 1 part sharp sand) with small pebbles mixed in for drainage. They thrive in pots and can withstand extreme heat. Sounds ideal for my garden! This is a picture of my plant from a year ago, just as it was about to bloom for the first time. As you can see, it is still in a fairly small pot. And this is its first actual bloom from last year. Soon its blooms were drawing flies like...um, flies. You see, the plant's common name of Carrion Flower refers to the odor of the blossoms, which is something like rotting meat, and that, of course, brings the flies in droves. Last year, though, I really couldn't detect much of an odor coming from my little plant's flowers. Obviously, the flies could. This is a picture of the same plant from a few weeks ago. As you can see, it has grown quite a bit in the past year and has had to be moved to a ten-inch pot, which it is also quickly outgrowing. And now, it is blooming once again, and not just one or two blossoms. It is covered in blooms and buds of all sizes. And no longer is there any doubt as to why the plant is called Carrion Flower. The odor is quite apparent and you don't even have to stick your nose close to the flower. Needless to say, the flies are ecstatic!